A" New York Times" Bestseller In the tradition of "Out of My Mind," "Wonder, "and "Mockingbird, " this is an intensely moving middle grade novel about being an outsider, coping with loss, and discovering the true meaning of family. Willow Chance is a twelve-year-old genius, obsessed with nature and diagnosing medical conditions, who finds it comforting to count by 7s. It has never been easy for her to connect with anyone other than her adoptive parents, but that hasn t kept her from leading a quietly happy life . . . until now. Suddenly Willow s world is tragically changed when her parents both die in a car crash, leaving her alone in a baffling world. The triumph of this book is that it is "not" a tragedy. This extraordinarily odd, but extraordinarily endearing, girl manages to push through her grief. Her journey to find a fascinatingly diverse and fully believable surrogate family is a joy and a revelation to read. * Willow's story is one of renewal, and her journey of rebuilding the ties that unite people as a family will stay in readers' hearts long after the last page. School Library Journalstarred review * A graceful, meaningful tale featuring a cast of charming, well-rounded characters who learn sweet but never cloying lessons about resourcefulness, community, and true resilience in the face of loss. Bookliststarred review * What sets this novel apart from the average orphan-finds-a-home book is its lack of sentimentality, its truly multicultural cast (Willow describes herself as a person of color; Mai and Quang-ha are of mixed Vietnamese, African American, and Mexican ancestry), and its tone. . . . Poignant. The Horn Bookstarred review "In achingly beautiful prose, Holly Goldberg Sloan has written a delightful tale of transformation that s a celebration of life in all its wondrous, hilarious and confounding glory. 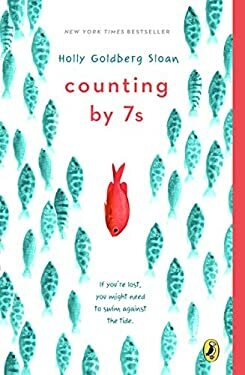 "Counting by 7s"is a triumph." Maria Semple, author of"Where d You Go, Bernadette""